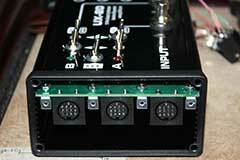 Optional independent EV-5 Volume Control for Synthesizer A and/or Synthesizer B. Switch to select power source, either powered by Synthesizer A or B, no additional power supply required. Weight: 1 lb. 1 oz. 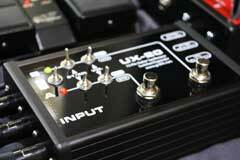 The UX-20 incorporates greatly expands on the functionality and features of the original Roland US-20. 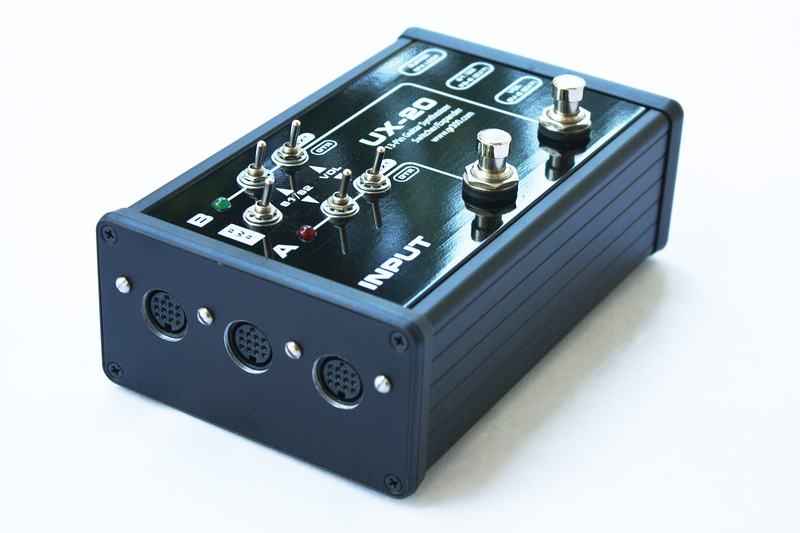 While the US-20 sends the same GK commands to both synthesizers A and B, the UX-20 allows for a variety of configurations for independent control over Synthesizers A and B. This includes independent GK Synth Volume control, and independent GK S1/S2 commands. 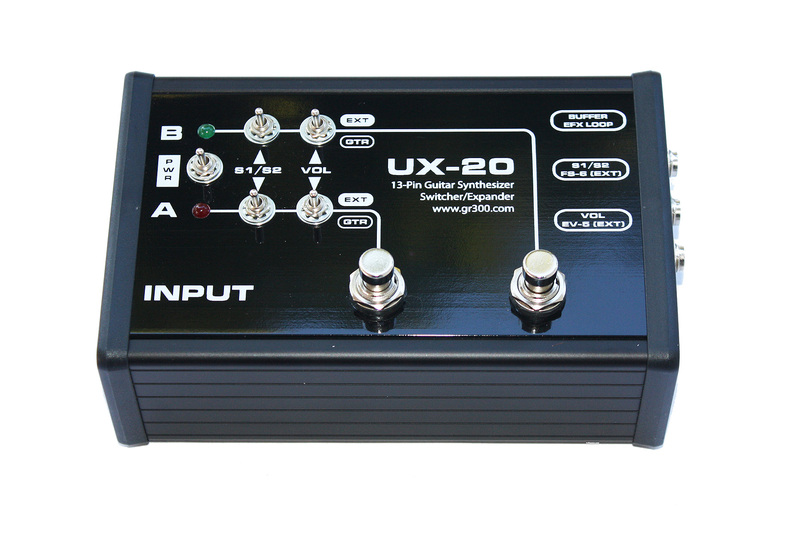 The UX-20 includes a buffered guitar input, based on the buffered input circuit from the original GK-Expander. 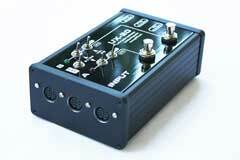 This enables non-GK equipped guitars can access the effects and COSM amp modeling in guitar synthesizers like the GR-55. The input circuit was primarily developed so that non-GK equipped guitars could access the COSM guitar amplifier modeling and effects in the Roland GR-55 guitar synthesizer. 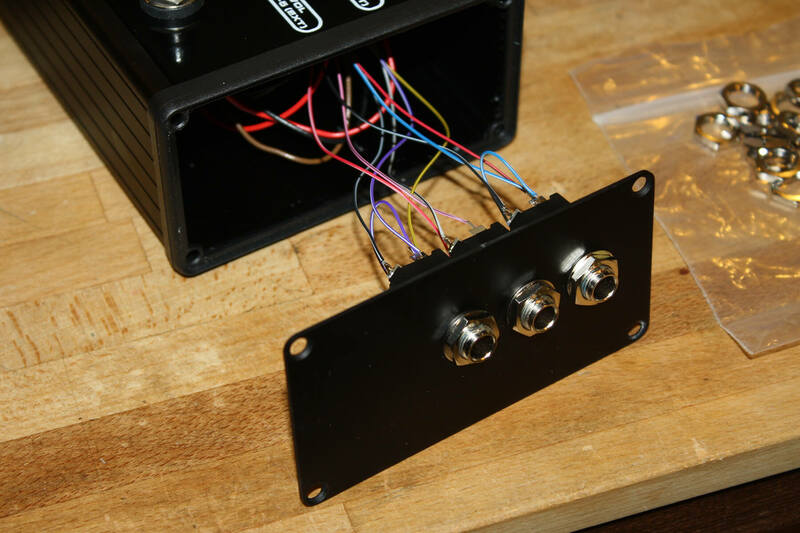 When GR users realized the GR-55 did not have a standard guitar input, like the Roland VG-99 does, the easy solution was to cut open a 13-pin cable, and just wire a 1/4” guitar jack to pin 7, the guitar signal. However, because of the impedance mismatch, this sucked all the tone out of the guitar signal. It sounded terrible. The UX-20 solves this problem with no loss of guitar tone. 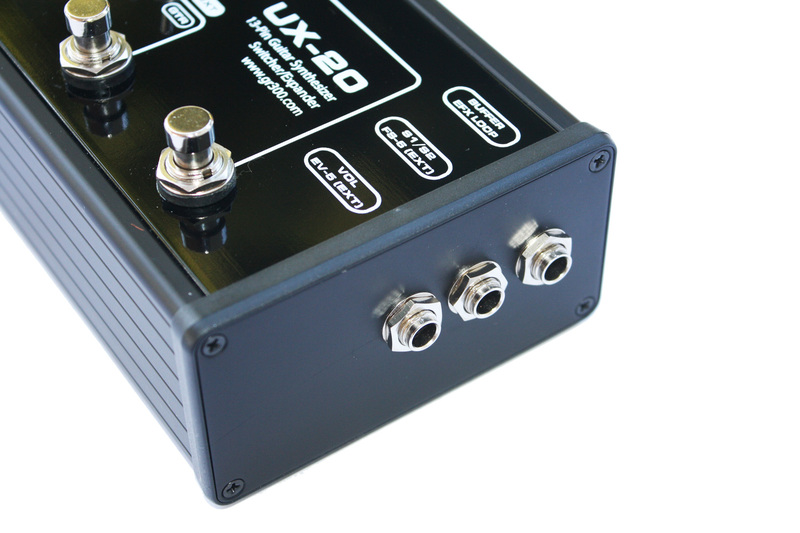 The buffered input on the UX-20 can also act as an effects loop, providing a high-impedance buffered input and output, using a tip-ring-sleeve cable. UX-20 Description of Controls and Operation. The UX-20 combines the features of the Roland US-20 Unit Switcher with the buffered guitar input and effects loop of the GK-Expander. 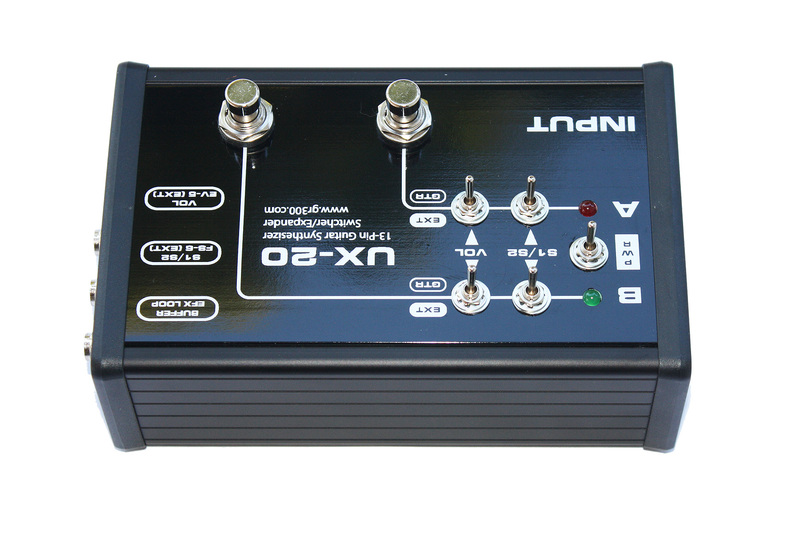 While the Roland US-20 sends the same GK commands to both synthesizers A and B, the UX-20 allows for a variety of configurations for independent control over synthesizers A and B. 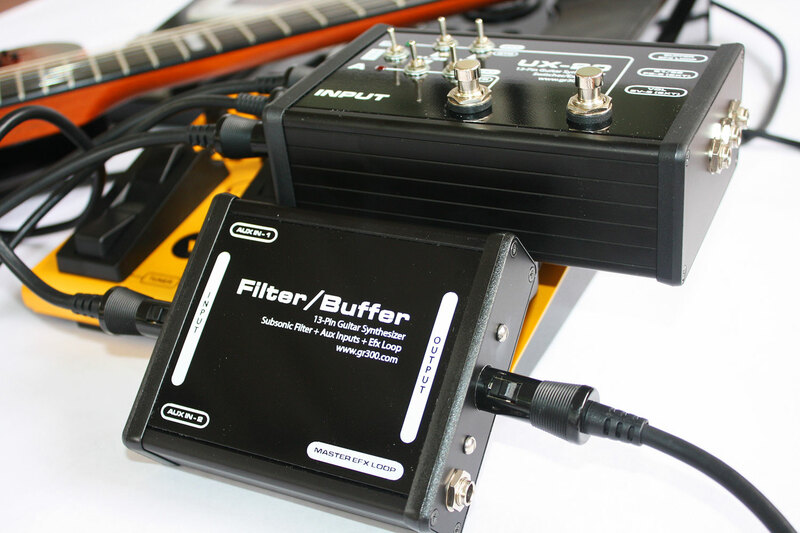 The buffered input/effects loop allows non- GK equipped guitars to access the COSM amplifier modeling and effects in synthesizers like the Roland GR-55. 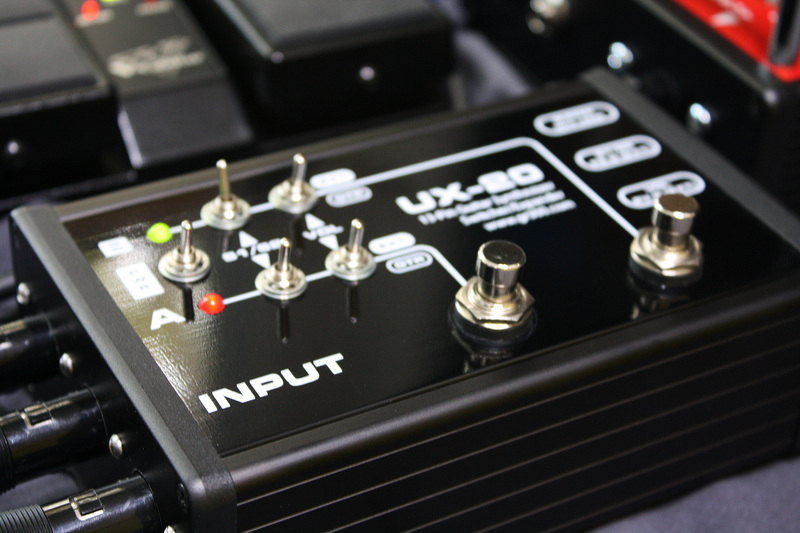 One of the most powerful features of the UX-20 is the buffered guitar input and effects loop. 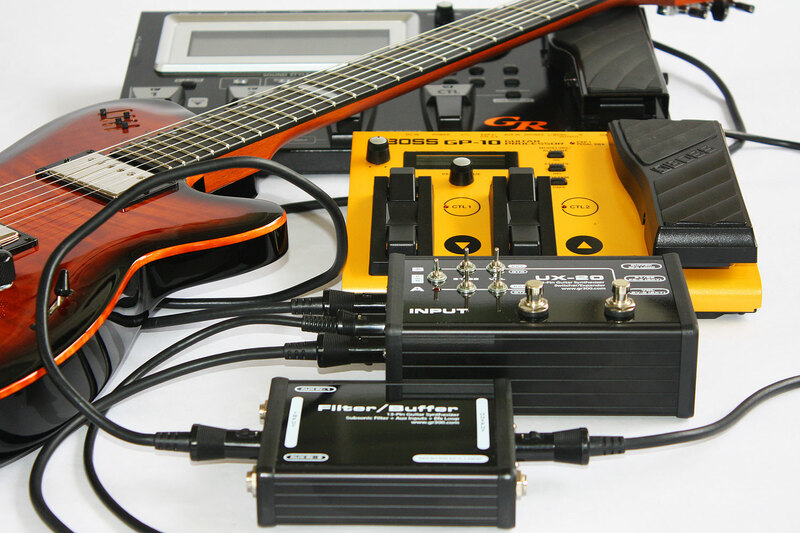 The buffered guitar input allows non-GK equipped guitars to access the COSM amp and cabinet modeling in the GR-55, as well as the extensive effects section, without the use of the special Roland GK pickup. The UX-20 circuit is designed to match the impedance of the buffer circuit in the Roland GK-2/2A/GK-3. 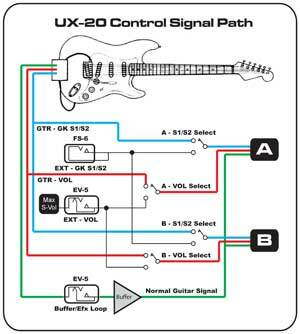 The diagram at the left shows how the normal guitar and GK Control signals are handled in the UX-20. 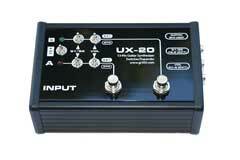 With all the switches in the "down" position, the UX-20 works much like a Roland US-20. 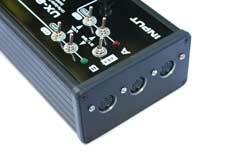 GK S1 and S2 switch commands, and the GK Synth Volume signals are sent equally to both Synthesizer A and Synthesizer B. With the power switch in the "down" position, power to the UX-20 is provided by Synthesizer A. With the Roland US-20, power is always provided by Synthesizer A. 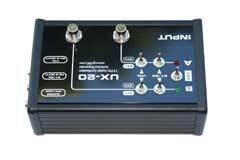 However, with the UX-20 you can choose Synthesizer A or Synthesizer B as the power source. 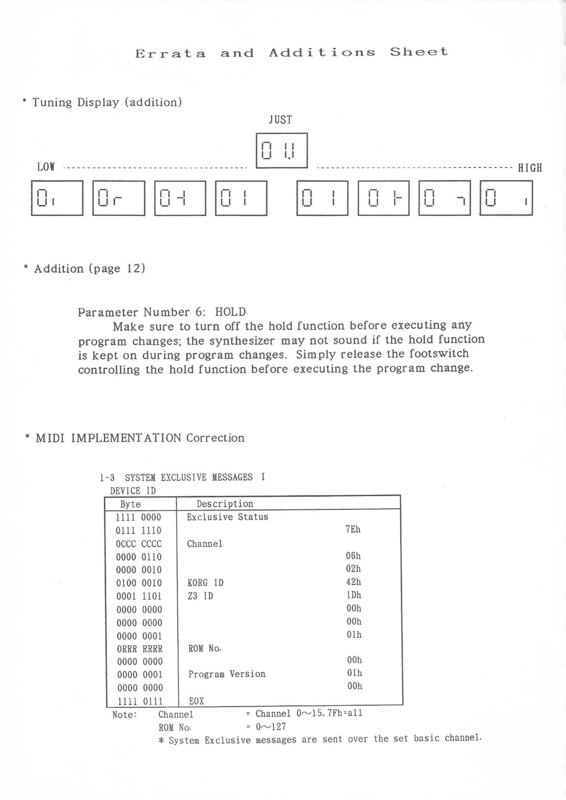 The "up" position selects Synthesizer B. 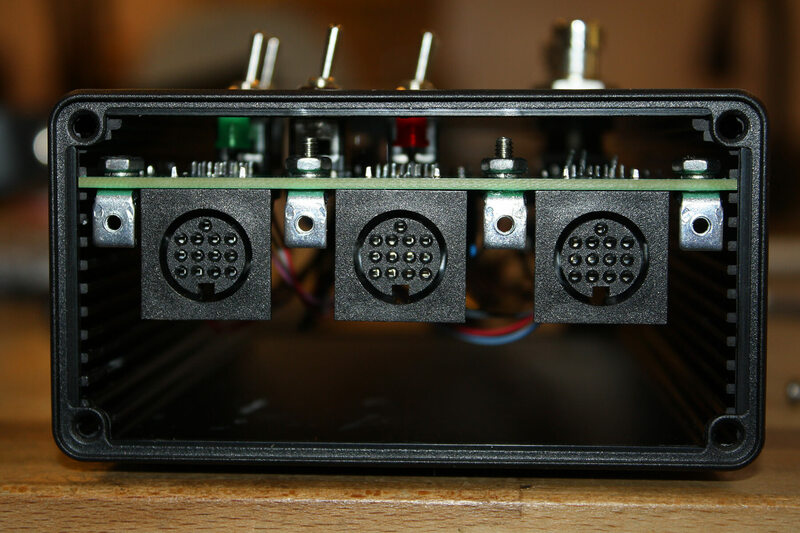 As noted, with the switches in the "down" position, the GK S1/S2 commands from the guitar are sent to both synthesizers equally. In this configuration, you can move the GK S1/S2 switch(s) on the guitar, and both synthesizers will change programs, parameters, etc. You can also flip the UX-20 GK S1/S2 switches in the "up", or "external" position. 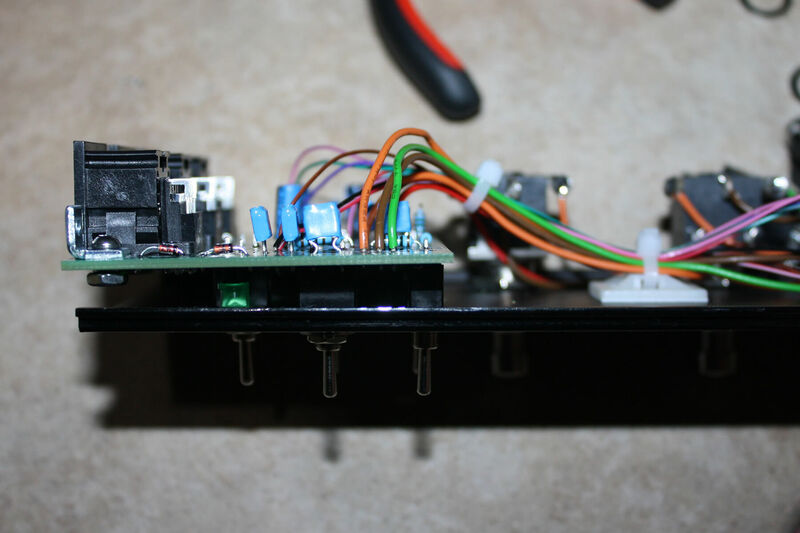 With nothing attached to the UX-20, this has the same effect as turning off GK S1/S2 commands to Synthesizer A or B. 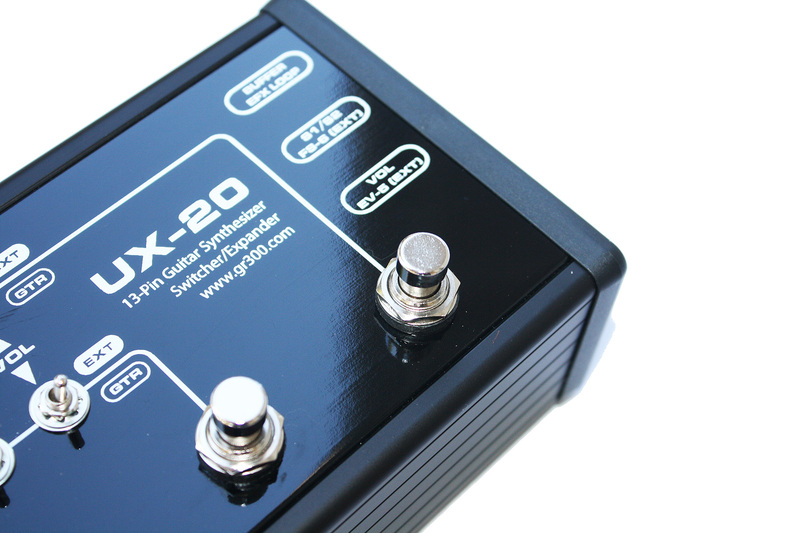 However, you can plug a Roland FS-6, or any basic on/off foot switch, into the UX-20 S1/S2 External input jack on the UX-20. 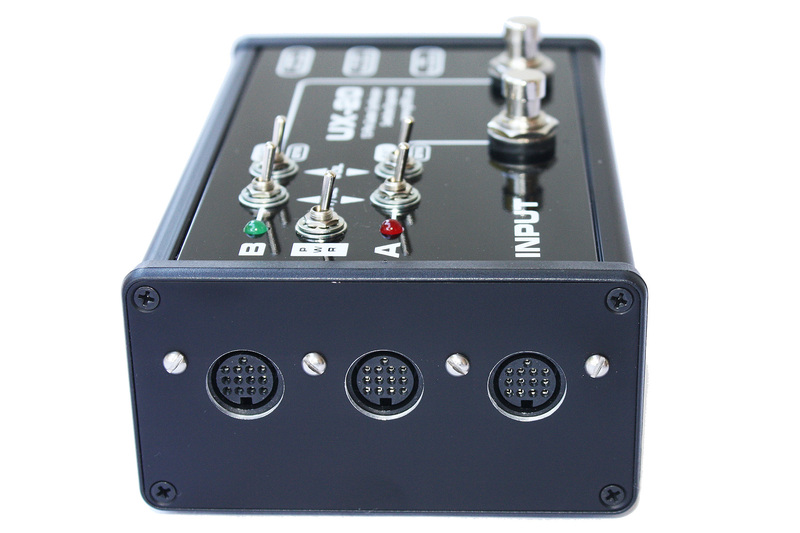 This enables you to send GK S1/S2 commands using a foot switch, rather than the switch on the guitar. You can set one Synthesizer to "guitar" and the other Synthesizer to "external" and have independent control over each Synthesizer. 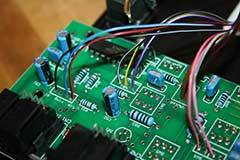 Synth Volume, or GK Volume, commands are generated when you turn the GK volume control on a GK-2/2A or GK-3 assembly. 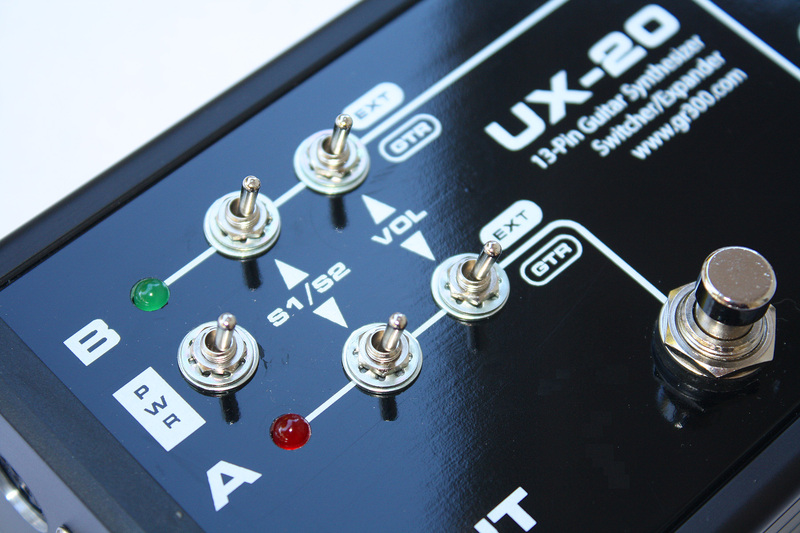 With the UX-20 Volume switch in the "down" position, the Synth Volume commands from the guitar are sent to both synthesizers equally. Pressing the Synthesizer A or Synthesizer B foot switches on the UX-20 will set the value of the Synthesizer Volume to "0", muting the output of the attached Synthesizer, and turning off the associated LED. Similar to the GK S1/S2 commands, you can also flip the UX-20 Volume switches to the "up", or "external" position. With nothing attached to the UX-20, this has the same effect as setting (GK) Synthesizer Volume to maximum. However, you can plug a Roland EV-5, or compatible foot pedal, into the UX-20 Volume External input jack on the UX-20. 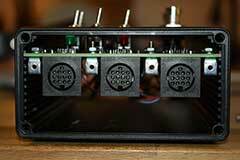 This enables you to control the volume of the Synthesizer using a foot pedal, rather than the knob on the GK2/2 or GK-3 assembly. 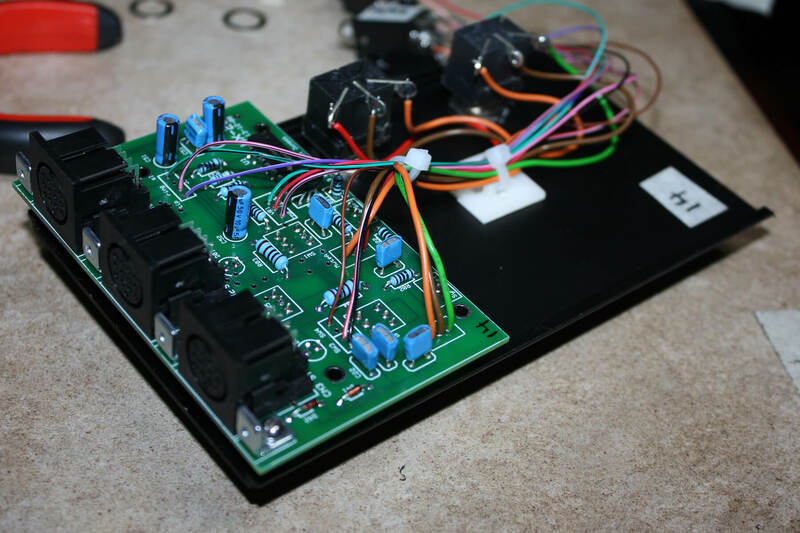 You can set one Synthesizer to "guitar" and the other Synthesizer to "external" and have independent control over each Synthesizer's volume level. 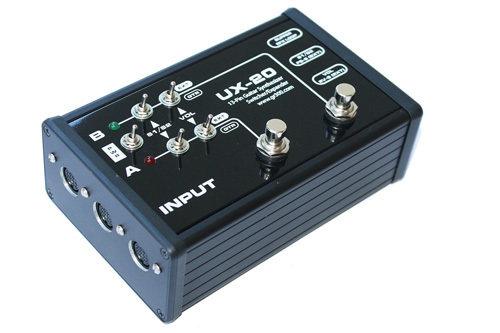 Perhaps the most exciting feature of the UX-20 is the Buffer/Effects Loop jack. 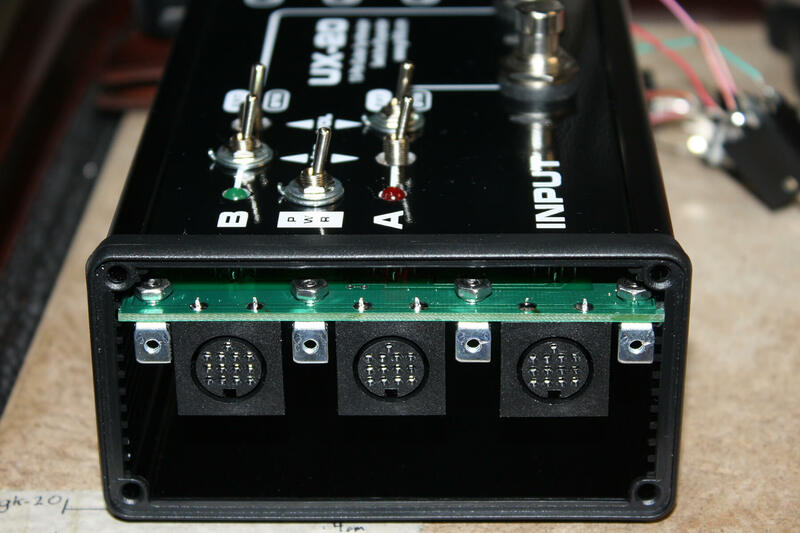 This jack can be used as either an effects loop, or to allow a non GK equipped guitar (or any audio source) to access the COSM modeled amplifier and cabinets in the GR-55, plus the extensive effects section in the GR-55. Plugging a standard 1/4" jack into the UX-20 disconnects the standard guitar output from the GK2/2A or GK-3, and replaces that signal with the signal from the 1/4" jack. A great way to test this feature out is to call up factory patch Lead 30-1. 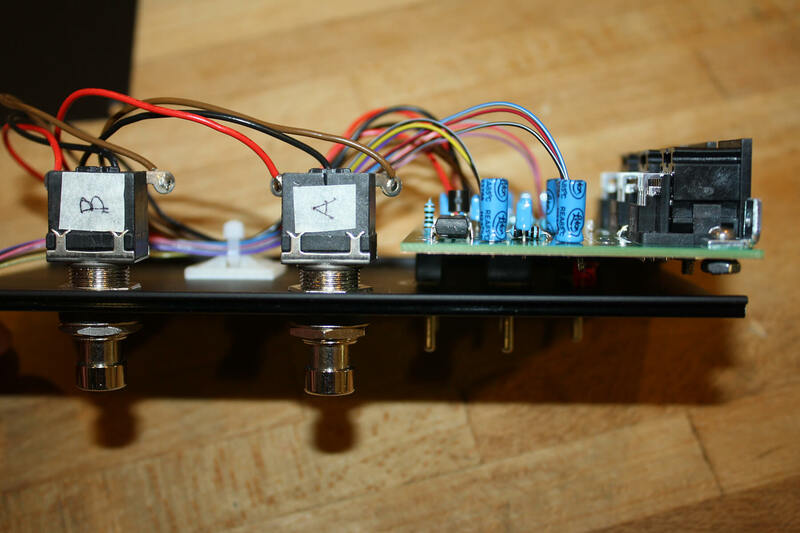 Plug a guitar into the Buffer/Effects Loop jack and check out the great guitar tones, courtesy of the modeled amplifier with chorus, reverb, and a touch of delay. Alternatively, the Buffer/Effects Loop jack can be used as an effects loop, with the "ring" as the "send", and the "tip" as the "return". Perhaps you have a favorite pedal that you like to use with your guitar. Use a Tip - Ring - Sleeve to Tip - Ring cable to insert your pedal into the normal guitar signal path. 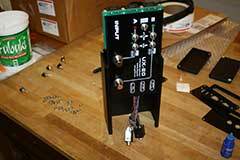 Now, whenever you select any patch on the GR-55 that uses the normal guitar sound, like factory patch Lead 30-1, you will hear the sound of your guitar passing through your favorite effects pedal before being processed by the GR-55. Or you can use a Roland EV-5 pedal to control the volume of the normal guitar signal, rather than using the volume control on your guitar. 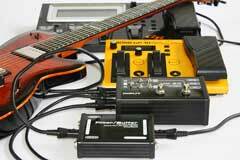 Here is one way to take full advantage of the Roland GR-55 while using a non GK equipped guitar. 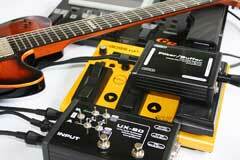 First, plug the guitar into the Buffer/Effects Loop jack. If you are using only Synthesizer A, then set the power switch to Synthesizer A, or if you are only using Synthesizer B, set the power switch to Synthesizer B. Set the GK S1/S2 and Volume switches to External. 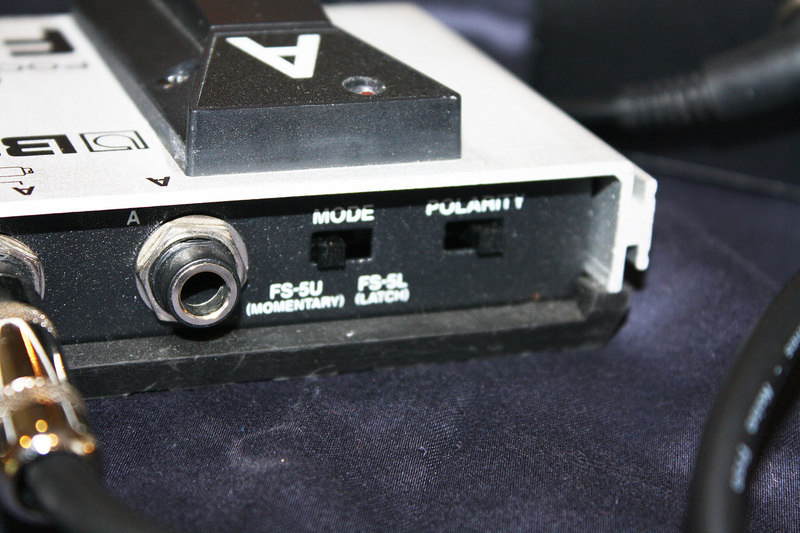 In this example, we will also plug a Roland EV-5 into the UX-20 Volume External input jack, and a Roland FS-6 into the UX-20 S1/S2 External input jack. Now power up the GR-55. 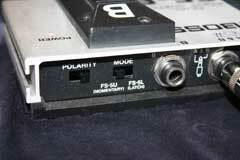 We can use the FS-6 foot switch to change GR-55 patches. 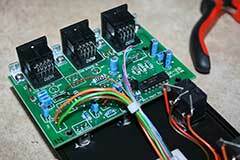 The EV-5 controls the output level of the GR-55. This rig works equally well with a bass guitar input. 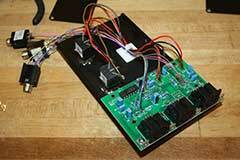 Just reboot the GR-55 in "Bass" mode, and plug a bass into the Buffer/Effects Loop. 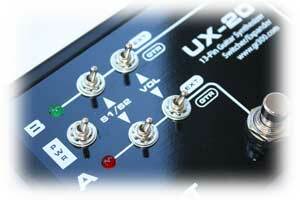 What effects does UX-20 enable non-GK equipped guitars to access in the GR-55? 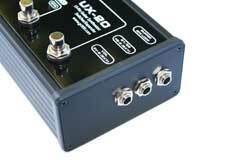 The UX-20 provides access to the Amplifier COSM modeling section, which includes parameters such as amplifier type (Fender Twin, Matchless, Marshall, Mesa/Boogie, etc. 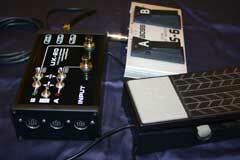 ), tone controls, speaker type (1x8", 4x10" etc. 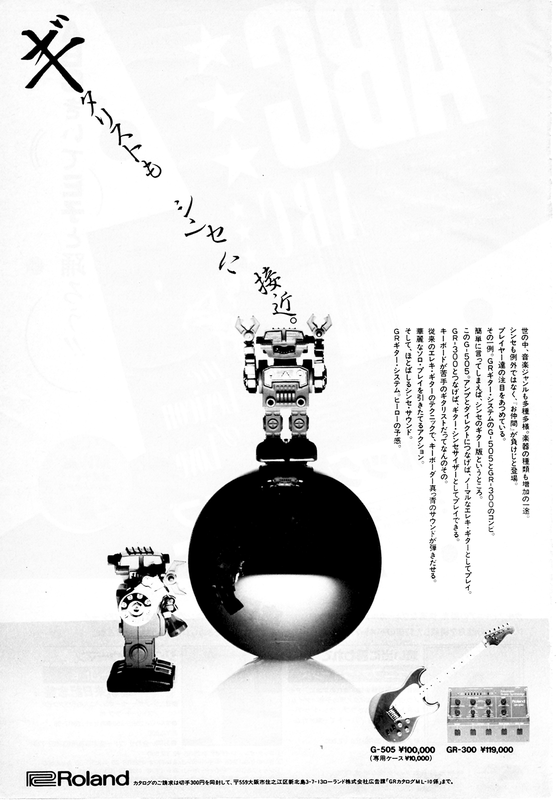 ), speaker microphone type (Shure SM57, AKG, Neuman, etc. 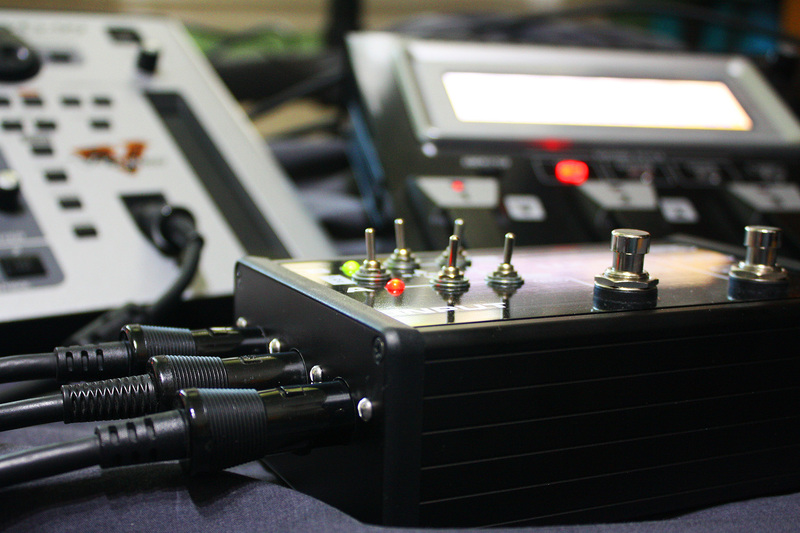 ), microphone distance, position, and microphone level. 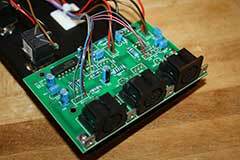 The Amplifier COSM modeling section is followed by the MOD section, which includes popular guitar effects like Overdrive, Wah, Compression or Octave. The Filter/Buffer also provides access to the MultiFX section. 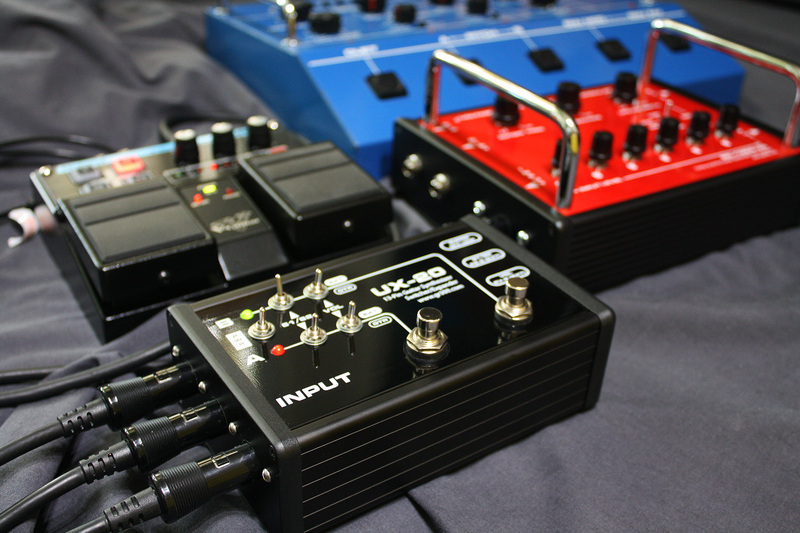 The MFX section has Roland effects from common (equalizer, phaser) to more esoteric effects such as Super Filter (switchable -12, -24 or -36 dB per octave filtering), Step Phaser, Slicer, and Lofi Compression. Finally, there is a global effects section with Chorus, Delay, Reverb, and Master 4 band equalizer, with hi and low shelving filters, and two sweepable mid-band filters. The Filter/Buffer input signals can also be looped using the GR-55 phrase looper, as shown in this video. 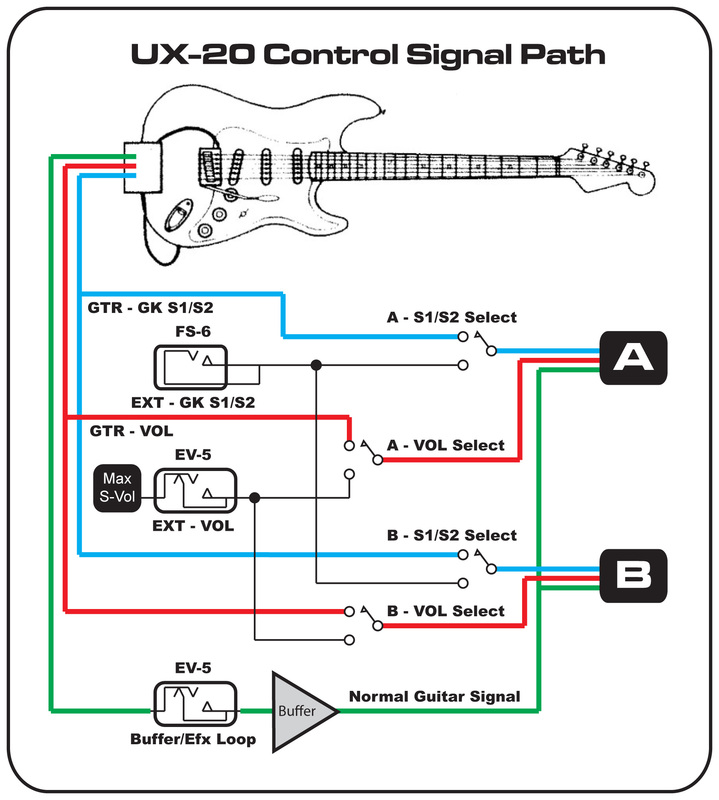 Does the UX-20 enable non-GK equipped guitars to access synthesizer sound in the GR-55? No. 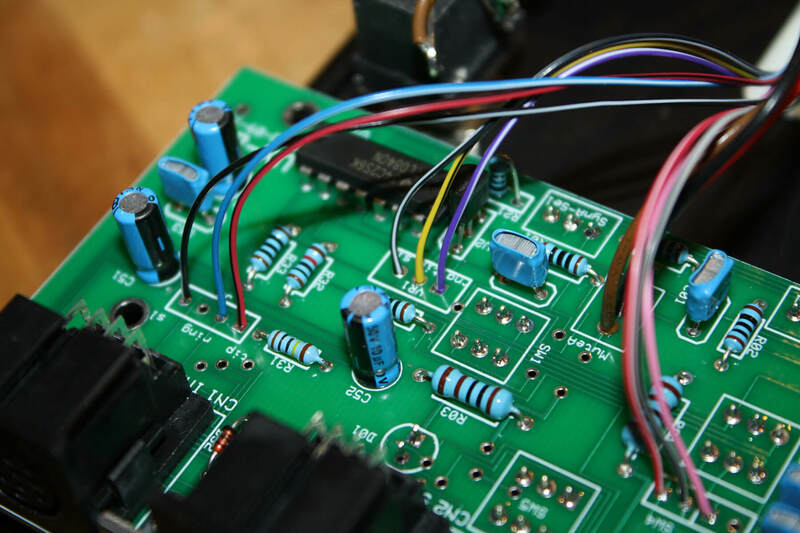 If you want to trigger piano sounds, or play the modeled Roland GR-300 analog synth, you will still need a divided hex pickup, like the Roland GK-3 or similar. I bought the UX-20 for the GR 55. I can not get the buffer guitar/effects loop to work. 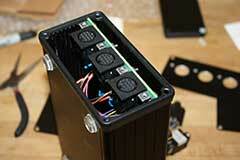 I do not hear the sound from my normal guitar pickups. The fastest way to test the UX-20 with the GR-55 is to call up factory Patch LEAD 30-1. Not all the factory presets allow the normal guitar input to be heard, but LEAD 30-1, 30-2, and 30-3 all use the normal guitar signal. I used LEAD 30-1 in the demo video, and everything Filter/Buffer is tested with this patch to insure the unit is properly functioning before it ships.